Island View Bungalows is located on the quieter, western shore of Gili Air off the coast of Lombok in Indonesia. Be sure to head left off the ferry and only after a short 20 minute walk through gorgeous scenery you will find yourself comfortably relaxing in one of Island View’s traditional Sasak-style bungalows. We felt like we had arrived at an oasis with the tallest palm trees we had ever seen, the sound of birds singing and a gently breeze of the islands trade winds. Lush green plants cover not only the Island View Bungalows property, but also the adjacent ones in both directions, giving us the feeling of being in the middle of nature. 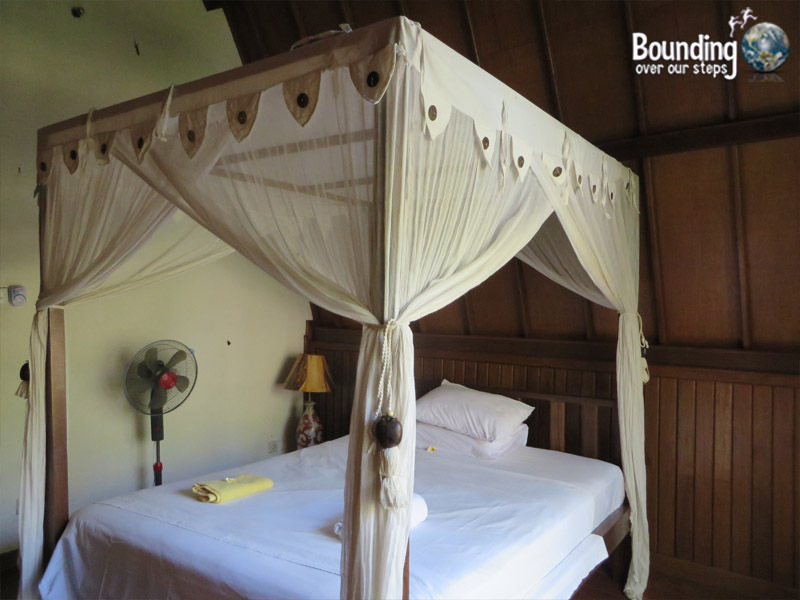 Each bungalow has been traditionally built with a thatch roof, high ceilings and hard-wood floors. 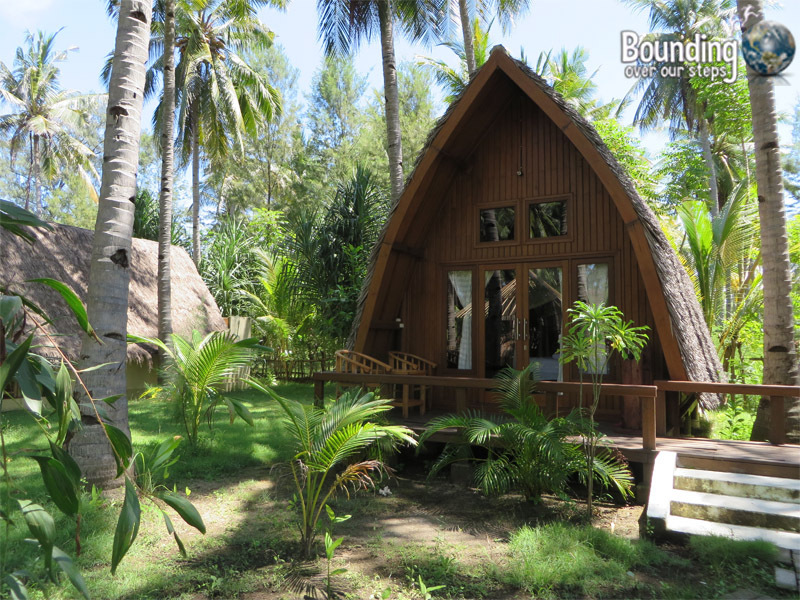 The front of the bungalow features large windows and a balcony with a nice place to sit to listen to the birds or perhaps watch a man climb one of the tall palm trees to retrieve some coconuts – it doesn’t get fresher that that! The bed was very comfortable and possibly the softest we had encountered in all of Indonesia. 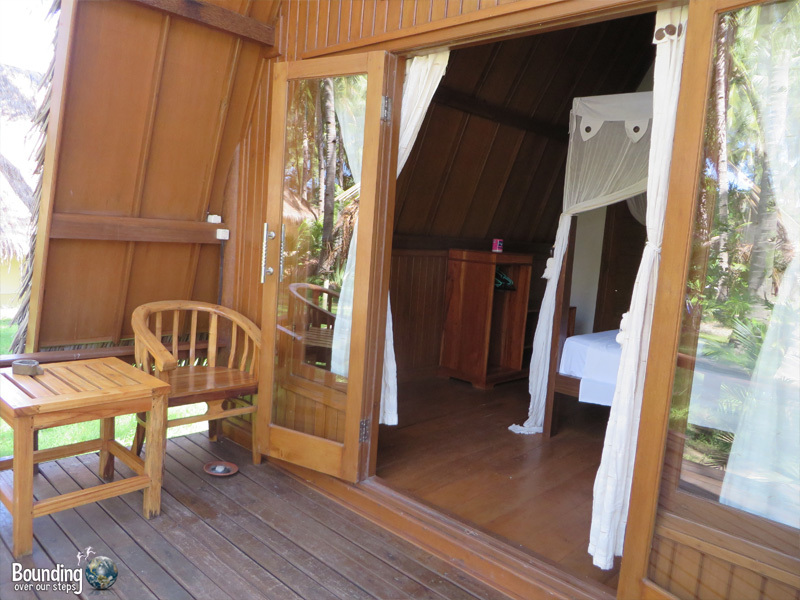 The open-air bathroom attached to our standard room was equipped for cool fresh-water showers with a view of swaying palms during the day and the Milky Way at night. Perhaps the best amenity is the ocean itself, which is only steps from your doorstep. 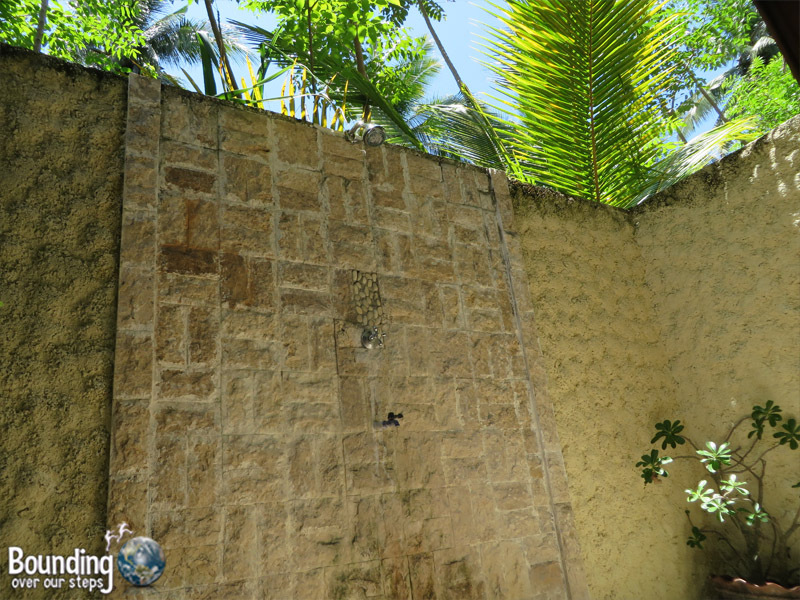 The Gili Air Wall is a snorkel distance from the beach. In addition, because of its western exposure, Island View Bungalows is the perfect place to watch the sunset every night. Bicycle and snorkeling gear rentals can be arranged. Free wifi is available throughout the property, both in the restaurant and in the rooms, with a strong signal. With its cushioned bamboo huts facing a secluded strip of beach, the restaurant attached to Island View Bungalows offers delicious food with a fantastic view. All over the island, you’ll find a large number of menu items common among different restaurants. 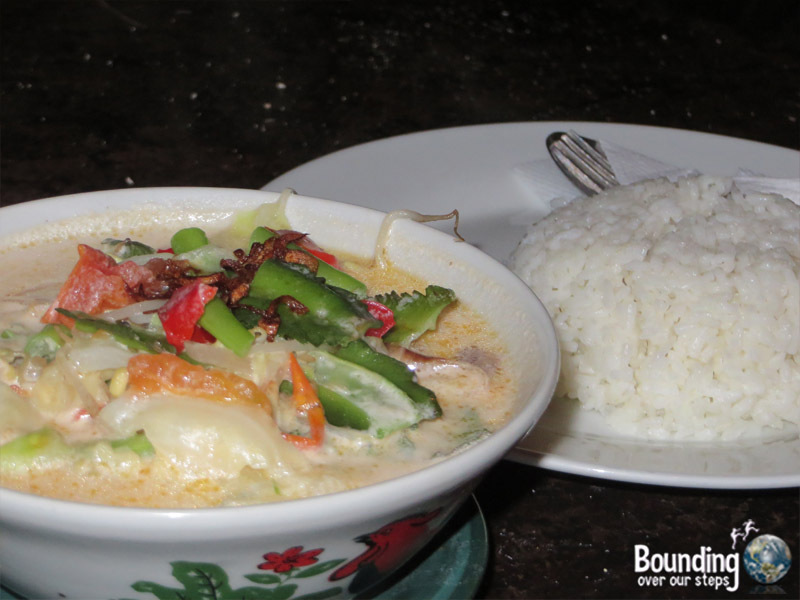 The Island View, however, also serves up a few reasonably priced vegan dishes we didn’t find anywhere else, such as the Sunny Salad (cucumbers, carrots, tofu and pineapple with a peanut sauce) and Olah Olah (vegetables in a creamy coconut soup with rice), a traditional Sasak recipe. Also on the menu for vegans are Indonesian favorites Nasi Goreng (fried rice) and Gado Gado (vegetables with spicy peanut sauce), but be sure to ask for them without egg and fish crackers. Spaghetti with a garlicky tomato sauce and a variety of appetizers also find their way onto the menu. 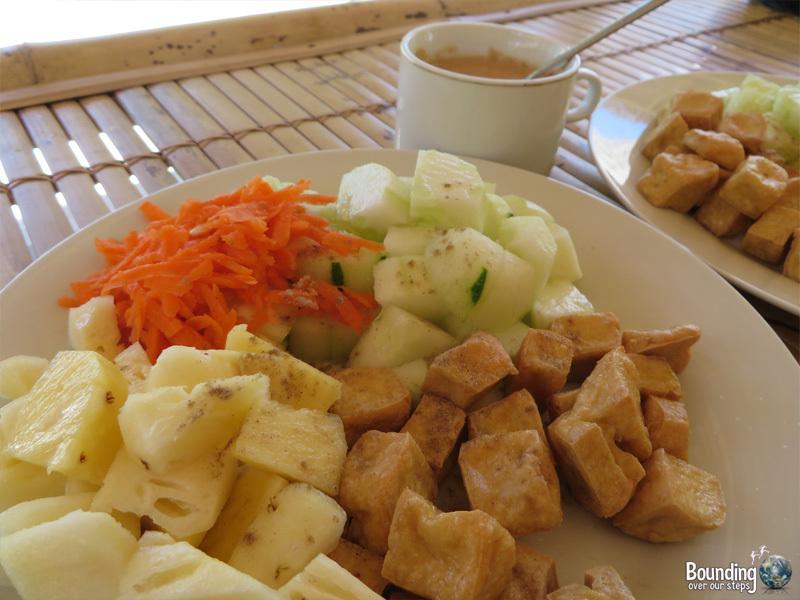 The breakfast, included with your stay is available between 7:30 – 11:00am. Although it is not as vegan-friendly as the full menu, the staff are more than willing to accommodate requests. We had a jaffle, a toasted sandwich, butter-less as requested, with tomato, but banana would also be tasty. Indonesian-style coffee, with free-floating grinds, or tea comes with the meal. 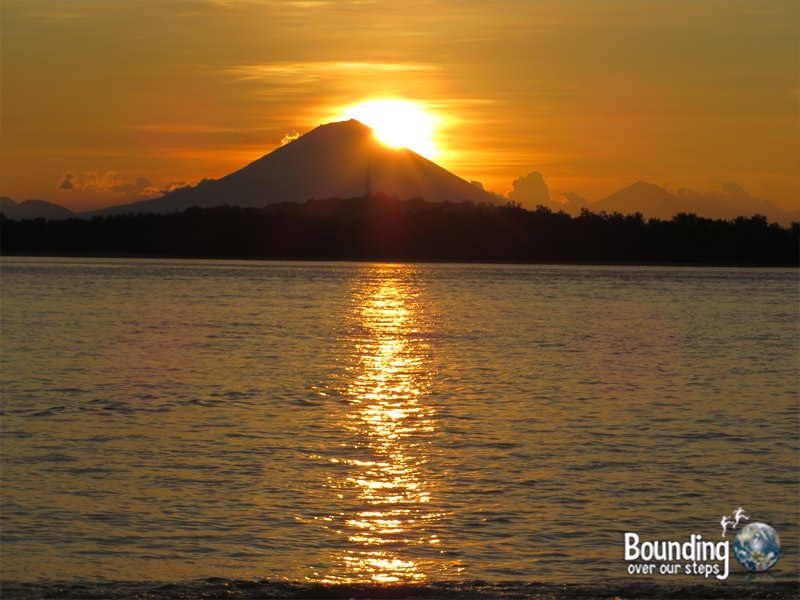 The next time we find ourselves in the Gili Islands, we’ll head straight to the Island View Bungalows on Gili Air!